This document has many references though it is unclear what information might have been gained from elite works such as D.C. Douglas’ ‘William The Conqueror’, L.M. Cullen’s ‘Life in Ireland’ and ‘The Reign of Stephen’ by H.A. Cronne, as well as numerous others listed. ‘General history: Gentry’, Magna Britannia: volume 6: Devonshire (1822), pp. CXXXII-CLX presents a similar but slightly different story: ‘Sillifant, of Combe, in Colebrooke. This family, who formerly wrote their name Sullivan or Syllivan, came from Beare, in Ireland, in 1641. Combe was acquired by marriage with Snell, in 1677. 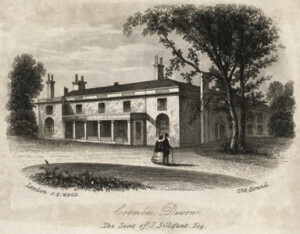 John Sillifant, Esq., now of Combe, married the heiress of Prideaux, of North Tawton.’ The Sillifants did acquire Coombe House on marriage, though the reference to Beare in Ireland is currently unconfirmed. Although the origin of the surname is currently unknown, it is clear that the bearers of the surname are predominantly Devon-based when they are in the UK. Reaney and Wilson’s ‘Oxford Dictionary of English Surnames’ gives references to Pellefant back in the fifteenth century – Judith 1612, Alse 1619 and Andrew Pilliphant 1633 in Hartland Parish Registers, Devon and states that Pillifant probably comes from East, West Pilliven in Witheridge, Devon. For Sillifant, wills for John Silliphant in 1616 and Thomas Sillafant in 1776 are noted. The ‘Consolidated Index to Devon Wills’ on the Genuki website – http://www.genuki.cs.ncl.ac.uk/DEV/DevonWillsProject – shows wills for Pill(i/e/a)v(i/e)n in the 1650s in Braunton, Ashford and High Bray in Devon as well as Christian Pyllaven, a widow of Chittlehampton in 1591.